Four collections plus a play(?) by Ayn Rand. My first by Tenn and Shaw. Based on the title alone my very first by Michael Bishop. ‘The Guardians’ by John Christopher which I began last night, finished this morning and enjoyed very much. (young adult dystopian tale) ‘The Return’ by Isidore Hailbum, three by Philip Jose Farmer, three by Ron Goulart, two by Robert Heinlein and one by Clifford Simak. In addition to the Bishop a lot of firsts for me this week with Christopher, Haiblum, Goulart and Simak. 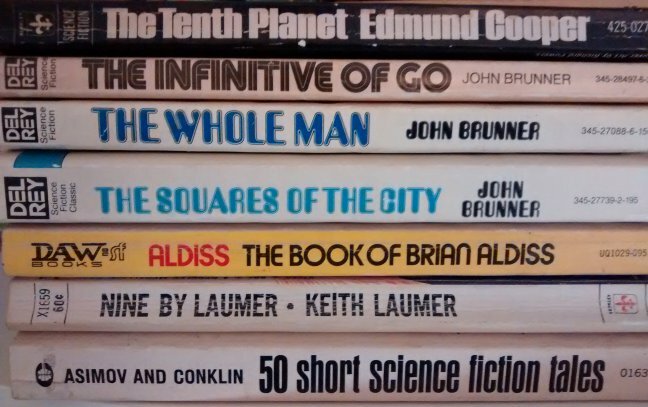 And BTW, at the bottom of the stack above is ‘The Profit’ by Kehlog Albran, (Kellog All-Bran, smirk) a parody of Kahlil Gibran’s ‘The Prophet’. My reaction was Huh? Huh? Huh? & Huh? My pop-culture icons range from Tom Terrific to Max Headroom but I’m apparently way out of touch with anything current. 185 contacts on 10, 15 & 20 meters (SSB). 47 counties. My goal each year is to work all 58 counties in California. Of the seven years I’ve participated, 50 is the most I have achieved. Finished with the re-reading of Jerzy Kosinski’s oeuvre. 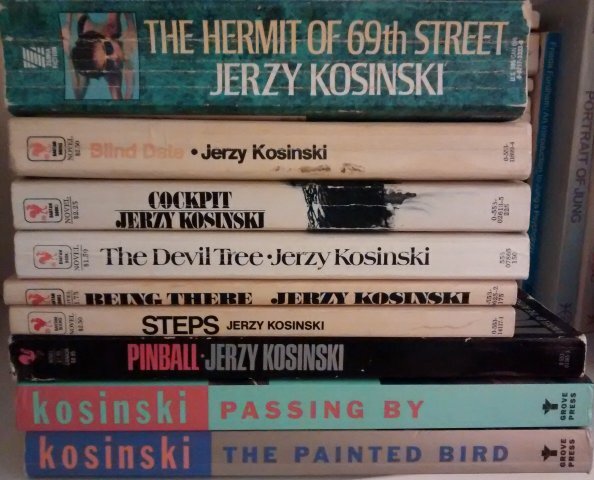 Ten years ago I was introduced to the novels of Jerzy Kosinski. He quickly became one of my favorite authors. (in December 2005 I posted about it here) Besides the content and style of Kosinski’s writing the form he frequently used shares a trait with two other authors I like – Richard Brautigan and Kurt Vonnegut. Many times since 2005 I promised myself I would reread his work. Recently I began to do just that but in a very methodical way. I began by reading James Park Sloan’s in-depth and eye-opening biography of Kosinski. I knew his life and work had generated controversy but was still surprised. As I reach the point in Sloan’s book where he talks about Kosinski writing each of his novels I put down the biography, picked up the novel and read it before continuing with the bio. Kosinski’s life is the basis for his novels, however fictionalized they (and it) may be. Kosinski had a lifelong habit of shaping the stories of his own life to fit the situation. He believed the truth of one’s own life was relative and subject to interpretation. Kosinski committed suicide in 1991 at age 57.